This orthopedic medical malpractice claim was filed in Frederick County when an un-credentialed doctor performed a negligent spinal surgery, causing permanent leg pain and weakness. It was filed in Health Claims Arbitration on January 26, 2018, and it is the 50th medical malpractice case filed in Maryland this year. A woman presented to Orthopedic Associates of Frederick (OAF) with complaints of lower back pain. Her doctor noted that she was in "obvious discomfort" and administered an intramuscular injection of Toradol and Depo-Medrol, an anti-inflammatory drug and a steroid used to treat pain. The doctor also provided a TENs unit (a machine used to treat nerve-related pain by sending stimulating pulses across the surface of the skin) and recommended physical therapy. Neither the doctor nor any other representative of OAF ever told the claimant that the doctor was not Board Certified in Orthopedic Surgery or Neurosurgery. The doctor is believed to have spent less than one year at the Spine Institute of Arizona, but she purportedly had very limited surgical experience at the time when she was treating the woman. The basis for these conclusions is unknown. After two weeks of physical therapy and no sign of improvement, the woman returned to OAF. Her doctor recommended an MRI, which the woman underwent one month later at Progressive Radiology. The MRI indicated enlargement of the facet joints and narrowing of the spinal canal in the L4-L5 and S1 regions of her spine, along with central disc herniation at S1. The doctor at Orthopedic Associates of Frederick reviewed the MRI findings and recommended epidural steroid injections and an L4-S1 spinal fusion surgery. The woman underwent surgery at Frederick Memorial Hospital. During surgery, the doctor was unable to enter on the left side, so she performed a right-sided construct instead of a bilateral construct. She was also unable to place a cage from the side, so she used a posterior lumbar cage instead at both L5-S1 and L4-L5, accessing the woman's spine from the back. Postoperatively, the woman complained of numbness in both of her legs as well as bowel and bladder incontinence. The woman returned to the doctor at OAF for three postoperative appointments over three months. During the first two visits, the doctor falsely reassured the woman that the surgery had been successful and there was no need for further treatment, in spite of the woman's persistent right leg pain. After reviewing the woman's x-rays one last time, the doctor finally recommended a revisionary procedure during the third visit. Soon after the third visit, the woman sought a second opinion. The second opinion doctor reviewed the woman's radiology studies and determined that one screw had penetrated the spinal canal, going through the left L4 nerve root, and another screw was dangerously close to the medial cortex. Because the nerve root located at L4 branches down the legs, nerve root damage at L4 often causes a type of radiating leg pain known as sciatica. The woman's new doctor performed the revisionary procedure nearly four months after the initial surgery, but she continues to experience chronic back pain, leg pain, and weakness in her right foot. The woman has also undergone further medical treatment to address the bladder and rectal prolapse that occurred as a result of the damage she sustained during the initial spinal surgery. Sciatica occurs when part of the sciatic nerve is pinched or compressed. The nerve compression causes inflammation, pain, and numbness branching from the lower back down through the leg and a loss of bowel or bladder function in the most severe cases. Sciatica can occur bilaterally, but it usually affects only one side of the body. When a hospital or a health care provider hires a new doctor, they have to do more than skim the doctor's resume. Hospitals use credentialing committees made up of doctors, lawyers, and other healthcare personnel to ensure that all of the hospital's employees are qualified and experienced enough to provide acceptable medical care. These credentialing committees are lawfully required to contact each and every of the doctor's previous employers to receive a reference about the doctor's past performance, going all the way back to the doctor's graduation from medical school. All certifications must be confirmed and any gaps in employment must be explained. A physician's credentialing process is extremely thorough, so it's difficult to imagine how an uncertified doctor could slip through the cracks at OAF and FMH. The defendant doctor has since moved out-of-state. She is listed online as a board-certified orthopedic surgeon. The doctor appears young so maybe she was not board certified when she first operated on this patient. Nisenfeld & Chilton, M.D., P.A. Failing to properly conduct the spinal surgery. Failing to provide sufficient postoperative care. Failing to treat the injury that occurred during the spinal surgery. Failing to accurately interpret the medical records. Medical Negligence: As a result of the defendant doctor's surgical negligence, the claimant suffered chronic back and leg pain. Negligent Hiring, Training, and Retention: Orthopedic Associates of Frederick, Nisenfeld & Chilton, and Frederick Memorial Hospital should have conducted a more thorough background check before hiring the defendant doctor and giving her surgical privileges. 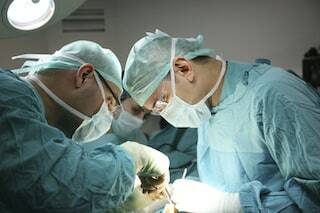 Informed Consent: If the claimant had been aware of the defendant doctor's lack of Board Certification and limited experience, she would not have consented to the operation. Negligent Misrepresentation: Each defendant health care provider negligently misrepresented the defendant doctor's competency to the claimant when their credential committee knew or should have known that the defendant doctor was not an orthopedic surgeon. Intentional Misrepresentation: The defendant healthcare providers had a responsibility to disclose 1) that the defendant doctor as not an orthopedic surgeon, and 2) that radiology studies following the claimant's surgery demonstrated that the pedicle screws entered her spinal canal. Punitive Damages: The defendant healthcare providers were grossly negligent and acted with malice.